Love, in any form, deserves celebration. If you or someone close to you is celebrating an anniversary then why not commemorate the great moment of love by designing a custom anniversary photo collage with pictures of all the great moments? With Canva, you can design the most stunning anniversary photo collages which you can then print out or post on social media to spread the love. There are ready-to-use collage layouts that you can use by simply adding your own pictures and modifying the text to create a beautiful photo collage in minutes. With our collection of photo collages, you will never be stuck for inspiration. And the best part? It’s all free! 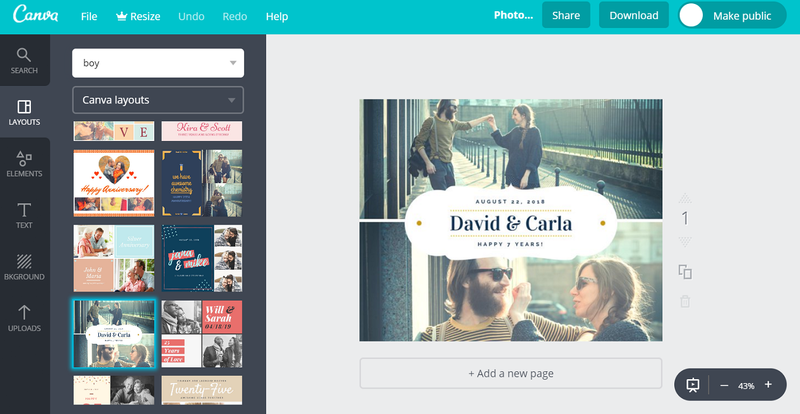 Create a new Canva account to get started with your own Anniversary Photo Collage designs. With thousands of layouts designed by professionals present on Canva, you will never run out of inspiration. You can select any one of the layouts and modify it accordingly by adding your own images and a personal message. Canva’s text tool has pre-designed font combinations and typography which makes adding messages on your designs incredibly easy. We also have over 130 fresh fonts so you can make your own font combinations as well. To add your favourite couple photos, click on the green ‘Upload your own image’ button and select the image you want add to the collage. You can use Canva’s grid and frame tool to make sure all the images fit well in the collage. All the uploaded images get saved in your Canva account, which you can use for other designs as well. Before finalizing the anniversary photo collage design, why not get help from your friends and family to make sure the design is absolutely perfect? Canva allows you to share your design with other users easily. All you have to do is, click on the share button and enter the email addresses of your friends. If you want them to edit the design, then check the ‘can edit’ box, otherwise check the ‘can comment’ box. Canva also has a huge media library with images, vectors, and graphics that you can add to your collage to make it look even more amazing. You can search for relevant images with a keyword and add them to the collage by just tapping on it. Most of the images are free, while only a few cost $1. Once your anniversary photo collage is all ready, it’s time to share it with the world. If you are planning to gift someone the collage, you can take a print of it and get it framed. To get high quality print, download the collage in the PDF-Print format which gives you 300 DPI (Dots Per Inch) quality. You can also directly share the design on Facebook, Twitter, and LinkedIn by clicking on the ‘share’ button. Download the collage in image format to send it via email or messaging apps like WhatsApp and Viber. You can access Canva and create collages by going to our website www.canva.com and signing up on it. To design on-the-go, you can also download Canva’s iOS app which is available for free on the App Store. How much does it cost to design on Canva? Absolutely nothing! Designing on Canva is completely free no matter how many times you use it. You are only charged when you use a protected image, graphic, or vector from Canva’s media library, which only costs $1 for each one-time use. Can I reuse the anniversary photo collage later? Yes, you can edit the collage any time later and change it as much or as little as you want. All your designs get saved on your Canva account, which you can access any time.